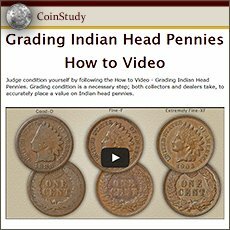 Minimum 1890 Indian head penny value is within the price range of many collectors. Because of this, it is one of the very popular and affordable US series to collect. Good news as it creates a large demand for your coin from those assembling sets. A collecting demand that continues to get stronger for the better quality 1890 pennies. Hobbyist along with coin dealers are always searching for these old pennies in the best condition possible. If a close look at your coin finds details within the feathers this confirms higher 1890 Indian head penny value. Pictured is a top quality example, the result of careful handling, this choice 1890 penny is easily worth over $46. 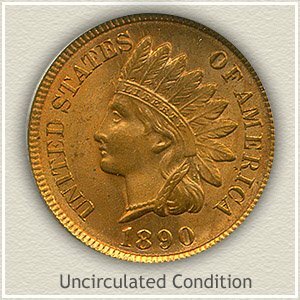 Just below the value chart are images and descriptions to compare your coin, giving you an idea of how collectors view its condition. Pictured is an exceptional 1890 penny obviously housed in elite collections since minted. Over the years only transferring ownership from one top quality set to the next. To the credit of all the collectors involved they maintained this coin in gem condition. Seldom are pennies of this condition rarity offered to the market. When it became available in a David Lawrence rare coin auction many specialist turned out to place bids. 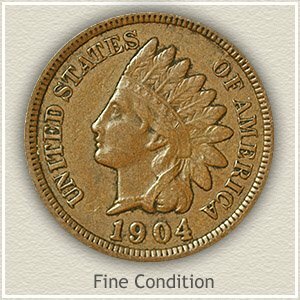 The final price to add a gem 1890 Indian penny to their collection was $799. A pleasing original fiery red and yellow gold still covers both the obverse and reverse. Adding to its top quality status is the almost total absence of marks on the coin. Obviously the luster and surface qualities were a perfect match to one collector. Values of pristine 1890 pennies often reach into the hundreds of dollars, however your 1890 in any condition is still considered a collectible. Judging a coin’s state of preservation is known as "grading" by dealers and collectors. How well your coin has survived and the amount of wear determines value. Noticeable features separate the varying degrees of possible wear, the differences are highlighted below. Fine: Noticeable are parts of the hair and headband have worn to the point of merging. Feather details are missing at the ends. Her cheek no longer is rounded. Despite this moderate wear your 1890 penny still has a pleasing look. Good: Heavy wear has reduced the portrait to almost a flat silhouette. The headband and hair above the eye are no longer separated, hair curls along her neck and ribbon are merged. 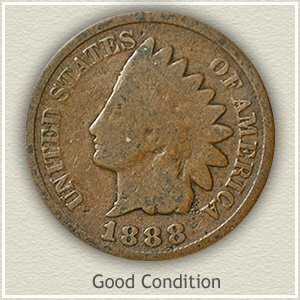 Despite its worn appearance your coin is popular among collectors and 1890 Indian head penny value indicates a strong demand. Common dates are now worth one dollar each. You have a popular coin, everyone understands and has heard of the value of an Indian Head penny. Many collectors are building collections and putting a heavy demand on very rare dates and better condition coins. 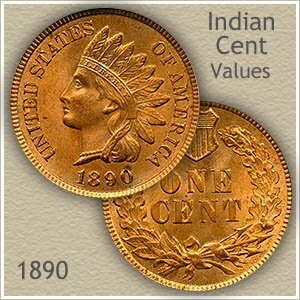 Compare your 1890 Indian head penny value to other dates on the values chart.